The Royal Monetary Authority of Bhutan (Dzongkha: བྲུག་རྒྱལ་གཞུང་དངུལ་ལས་དབང་འཛིན་) is the central bank of Bhutan and is a member of the Asian Clearing Union. It is also the minting authority for the Bhutanese ngultrum. The Royal Monetary Authority of Bhutan was established under the Royal Monetary Authority of Bhutan Act of 1982. Subsequently, the Act of 1982 was amended by the Financial Institutions Act of 1992 and replaced in its entirety by the Royal Monetary Authority Act of 2010. 1 2 3 4 "Royal Monetary Authority of Bhutan". Government of Bhutan. Retrieved 2011-01-29. 1 2 "Royal Monetary Authority Act of Bhutan 1982" (PDF). Government of Bhutan. 1982. Retrieved 2010-10-08. 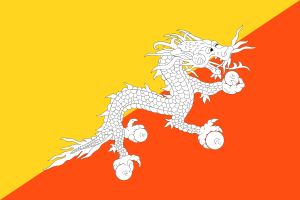 1 2 "Financial Institutions Act of Bhutan 1992" (PDF). Government of Bhutan. 1992. Retrieved 2010-10-08. ↑ "Royal Monetary Authority Act of Bhutan 2010" (PDF). Government of Bhutan. 2010-06-22. Retrieved 2010-10-08. ↑ "The Constitution of the Kingdom of Bhutan" (PDF). Government of Bhutan. 2008-07-18. Retrieved 2010-10-08. "Royal Monetary Authority of Bhutan". Government of Bhutan. Retrieved 2011-01-29.